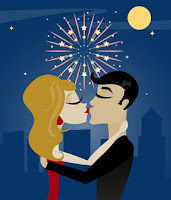 I have never, in my thirty years and through many boyfriends/dates, had a kiss at midnight on New Year's Eve. Mostly coincidence. Interesting nonetheless.